Just because you’re not selling a home doesn’t mean you can’t participate in an iBuyer program. On Thursday, real estate tech startup Knock launched a new product for first-time homebuyers: Knock will help them get pre-approved for a mortgage, buy a house on their behalf in cash and then transfer it over to them. “First-time homebuyers in particular do not have the equity from an existing home to leverage, so our solution will give them a big leg up on the competition,” Knock founder and CEO Sean Black said in a statement. Working as a brokerage, Knock gets its real estate agents to find homes that customers like and then make all-cash offers for them, without charging the customer fees. Instead, Knock receives its broker commission from the homeseller, just as any buyer’s agent typically would in these transactions. Knock’s products also include solutions for people who only want to sell their home, and those who want to sell an old house to move into a new one. Knock’s home trade-in model lets sellers find a desired new home. Then Knock buys that home outright with all-cash, makes repairs improvements and sells it back to them, all the while helping to fix-up and list their old home for sale. According to the company, its new buyer-centric solution will help new those who have no equity but want to purchase in a markets growing rapidly alongside new employment opportunities. “Knock is on a mission to make homebuying and selling certain, convenient and cost-effective, so we’re excited to launch this new product that will help homebuyers compete in an increasingly difficult housing market,” Black said. Right now, the startup operates in Atlanta, Charlotte and North Carolina’s Research Triangle and plans to expand to more than 10 other markets but the end of 2019. Launched in 2016 by the founding members of Trulia.com, Knock raised $32.5 million Series A funding from investors. As public interest in iBuyers grows, Knock works by purchasing houses in cash and then working out a mortgage agreement with the homebuyer. To go with the launch of the new product, Knock also released forecast reports for three of the markets in which it currently operates. 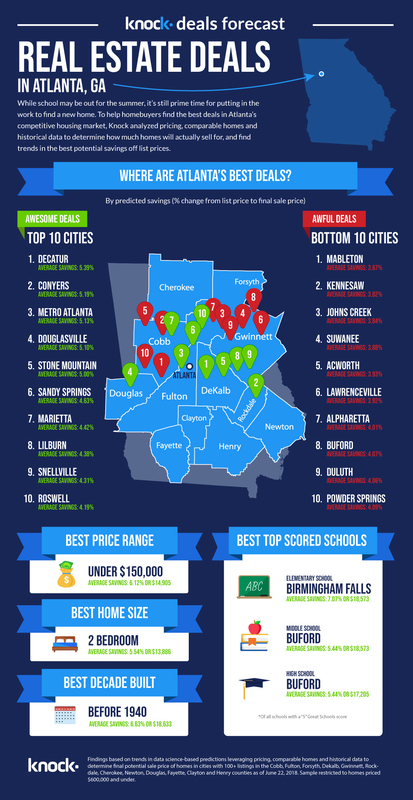 According to the reports, Decatur, Georgia; China Grove and Louisburg, North Carolina, are the best cities in which to buy a home right now. It also predicts that listings currently on the market can save 4.66 percent in Atlanta, 2.97 percent in Charlotte and 2.23 percent in the Research Triangle.